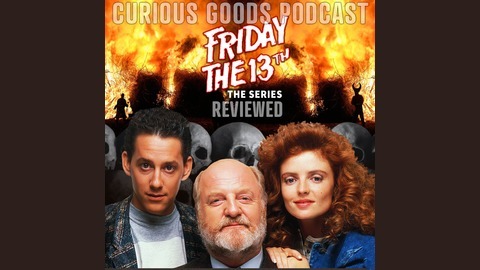 The Curious Goods Podcast - Reviewing "Friday The 13th: The Series"
There are NO Hockey Masks here! Enjoy a giant bite of nostalgia as we review each episode and tell what you why you what made an 80’s Canadian series (Friday The 13th: The Series) great. It’s time to tell the Tales of the Recovery of Cursed Antiques! There are many cultures with their own peculiarities. Inside our most recent story, there is-ith a culture that is showcased-itht called the Pennatites, a culture similar to the Mennonites of the North East, who dress simply, lead simple lives, hold the Lord and separated genders at the heart of their laws and a community that features a quilt! One that is at the center of murderous dreams…murderous dreams most foul! 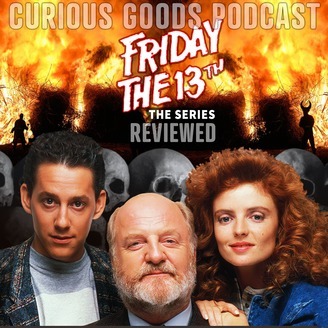 It’s the pattern tapestry literally at the center of this episode of the Curious Goods Podcast, a retelling, a revisit and a compleat educational detailing of each episode of Friday the 13th The Series, this time Season 1, Episode 19 The Quilt Of Hathor! — 2GuysTalkingStarWars Fill Your Ears With The Force! — Patchwork = The craft of sewing in which small pieces of cloth in different designs, colors, or textures are sewn together. — Penny Squares = Something used in quilting. Tell us what you think! It’s never too late to be an advertiser in this podcast, thanks to Perpetual Advertising! Contact us now and learn more about why podcasting allows your advertising dollar to live across millions of future listeners – FOREVER! Tell Us What You Think About Friday The 13th: The Series!